Salsa Fresca (fresh salsa) is mixture of fresh tomatoes, onion, jalapeño, cilantro and lime juice. It’s different from the homemade canned salsa or store-bought salsa as it’s crunchier, chunkier and is less runny. The main difference is that it tastes fresh! Isn’t Salsa Fresca and Pico de Gallo the Same Thing? There’s lots of debate between the difference between Salsa Fresca and Pico de Gallo. The names are commonly interchangeable with each other. There are variations across Mexico depending on the region, and even differences from ingredients. It’s an easy way to use up tomatoes from your garden, perfect as dip with nachos chops or on tacos. Pico de Gallo translates to beak of the rooster and I haven’t the foggiest idea as to why it’s known by such a name. It seems like the origins of the name aren’t very clear. I think I prefer Salsa Fresca, as fresh salsa sounds so much tastier! Some people prefer to throw all these ingredients into a food processor to blend it together. I prefer a bit of a chunkier Salsa Fresca, and chop everything by hand. It’s not a hard and fast rule with the measurements. Use up what you have in the garden. If you have a few extra tomatoes, throw them in! Just taste and adjust as necessary. If your tomatoes aren’t sweet, you might want to add a ½ teaspoon of sugar. You can use Agave Nectar as a Mexican sweetener, but I find it’s expensive and probably unnecessary. Keep the Salsa Fresca refrigerated. Make it ahead the night before. The flavors develop the longer they sit. 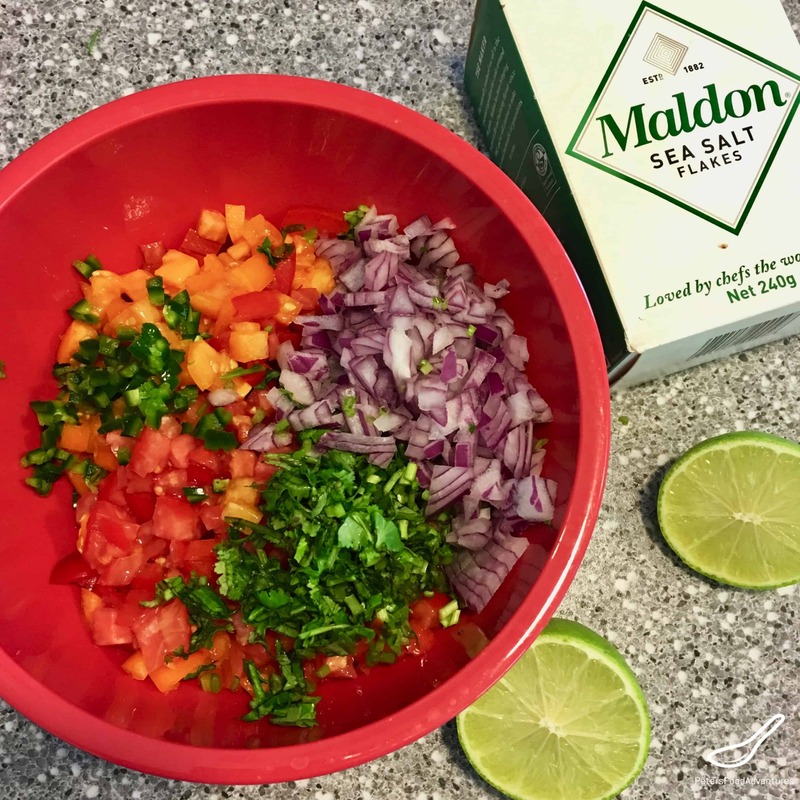 No matter what you prefer to call Fresh Salsa, Pico de Gallo or Salsa Fresca, it’s a delicious way to eat your summer vegetables, with an authentic Mexican flair. Bon Appetit! Приятного аппетита! Mix together tomatoes, onion, jalapeño, lime juice, salt and cilantro. Allow to sit for at least 15 minutes before serving to allow flavors to meld together. Some people like to strain the tomatoes from the juices for a chunkier and drier salsa. If you prefer this, simply place chopped tomatoes in a strainer for about 30 minutes to allow juices to drip out.